NEW FACILITY: Larry Kiernan stands near his water truck after uncovering the sign at the new breakdown facility. A NEW road train breakdown facility, beside the Flinders Hwy at Roseneath in north Queensland which opens today, is sure to be popular with truckies. The Department of Transport and Main Roads has provided this new facility, located near the new traffic lights on the Flinders Hwy, for truck drivers to breakdown their vehicles prior to entering the city of Townsville. It is about 15km west of Townsville as you head towards Charters Towers. Big Rigs visited the facility on Monday June 18, as the finishing touches were being done by workers. Larry Kiernan was driving an Isuzu water truck and Big Rigs snapped his picture. The area was a hive of activity as the last part of the work was being done. Two industrial bins are located at the back, right-hand side of the site. Drivers must leave the site in a clean manner and free of rubbish. Signs have been placed strategically beside the highway in both directions to advise truckies of its whereabouts. As many companies and drivers as possible have been advised about the facility by the department. Any damage or environmental issues must be immediately reported to the department by phoning 4720 7200. Big Rigs went to the huge BP Cluden Roadhouse about 10km away and all the truckies we spoke to were enthusiastic about the facility. 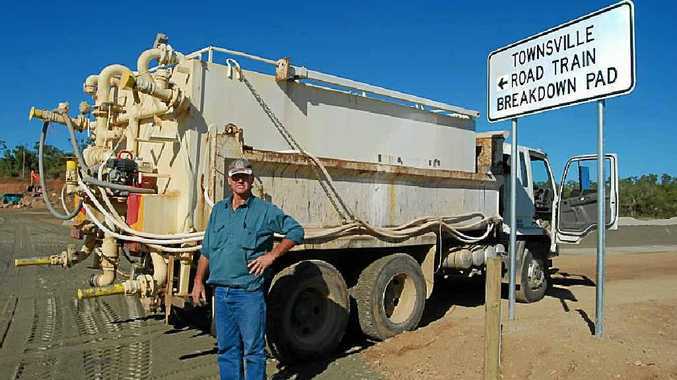 Many have been using an unofficial pad beside the Flinders Highway for breaking-down purposes. There used to be a loading and unloading pad nearby beside the Flinders Highway which officially closed several years ago.